Whether you're thinking about starting a business or just want to settle a bar bet, there is information someone can use in the latest edition of the State Data Book. Want to open a pet store? Hawaii counties issued a record 53,415 dog licenses last year. Only 24 dog licenses were issued on Lanai, one less than in 2004. Selling personalized key rings? Joshua and Emma are the most popular names for babies born in Hawaii in 2004, with Isabella rising to No. 2 for girls from No. 8 in 2003, and Tyler, Chloe and Alexis entering the top 10. The most common last name for new babies is Lee, followed by Smith, Kim and Wong. 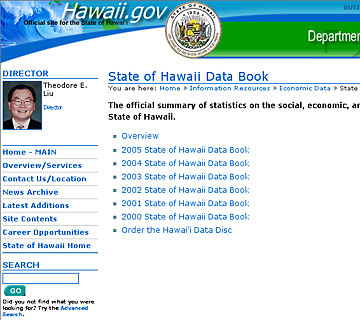 Pearl Imada Iboshi, the state's lead statistician, said the data book puts the information people ask her department for in one place. There are basic facts like the state's population (1,275,194 as of July 1, 2005, plus an average of 185,445 tourists each day) and facts on the average amount a consumer spends in Honolulu ($48,339 a year, which includes $367 annually on alcoholic beverages and $1,277 on gasoline and motor oil). In all there are 797 tables in 24 categories from agriculture to travel that are now available on the Web site of the state Department of Business, Economic Development and Tourism. The department added 27 tables to this year's data book, including one on parking costs in downtown Honolulu (median: $160 a month), and deleted 21 tables because the statistics had not changed in several years. It has almost anything anyone would want to know about Hawaii -- except for the top 10 names for dogs.